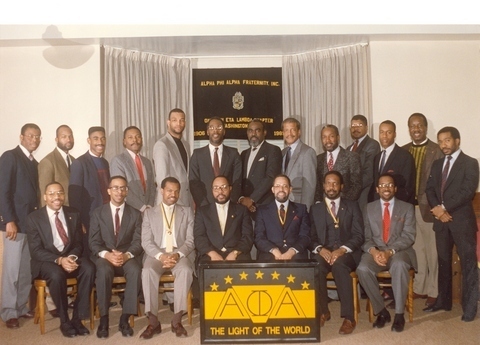 During the early 1980’s, the General Organization of the Alpha Phi Alpha Fraternity began a movement to increase the number of active Brothers, for, even though at that time, the fraternity had made over 100,000 men into Alpha Brothers, only about 12,000 were actively involved in regular chapter activity and had met their responsibilities in paying Grand and Chapter taxes. One of the efforts involved Reclamation, which is the function of reactivating Brothers who for one reason or another, were no longer active. During this period, there were two alumni chapters in Washington, D.C.: Mu Lambda and Omicron Lambda Alpha however, there were many Brothers living and working in the Washington, D.C. area, who chose not to affiliate with either chapter. Simultaneously, the membership of Mu Lambda consisted mainly of Brothers who averaged fifty to sixty years of age. The membership of Omicron Lambda Alpha (OLA) was principally graduate and professional students. This left those Brothers, who were the young professionals averaging thirty to forty-five years of age, with the feeling that neither chapter suited their needs. Some of the Brothers who fell into this category were members of Omicron Lambda Alpha Chapter, and one of them, the late Brother Hubert E. Michel decided that perhaps another alumni chapter ought to be formed with the intention of targeting the young professionals in the area who were not affiliated with either of the two alumni chapters, and who liked the idea of community involvement. Bro. Michel spoke to then Eastern Regional Vice President Brother William Ross and Washington, D.C. Area Director, Brother Ryle Bell, also then a member of OLA, and they began discussions with some of the Brothers not yet affiliated with any chapter. Meetings were held at the home of Brother Duane Calloway with other Brothers such as Robert Warren, Reginald Lawrence and Jaru Ruley After about six meetings, it was determined that enough interest existed and that there were enough Brothers who wanted to start a new chapter. Eastern Regional Vice President Ross was contacted by Brother Bell and the paperwork was sent forward to charter this new chapter.